The complex effect of SCENAR-therapy is demonstrated in situations of emergency, when various conditions associated by acute pain are treated. The result of monotherapy of pains: proved analgesic effect at traumas (n=20, 60%); analgesia against a background of normalized function of the system of organs at stenocardia (n=26, 66%) and hypertensive crises (n=153, 88-91% for cephalgia, and cardialgia respectively). The issue of protecting patients against pains has an enormous humanistic importance. Pain is a signal of danger, a symptom of many diseases, main reason for patients to suffer, basic pathophysiologic factor of developing shock. It is known that pharmaceutical methods of analgesia are imitation of the functions of endogenous system to protect against pain. They are important when performing mass analgesia. Starting the endogenous antinociception system is optimal when methods of reflexotherapy are used, and this method is more physiologic. The complexity of the methods, their invasiveness, impossibility to be used in extreme circumstances, lack of reliable and inexpensive equipment, and insufficiency of trained specialists are the factors that obstruct mass introduction of reflexological methods of analgesia. Methods of transcutaneous bioregulated low-frequency impulsive electrotherapy have been used recently for non-pharmaceutical treatment [5,6,7], particularly – self-controlled energy neuroadaptive regulator (SCENAR). This method is based on the effect of bipolar impulsive points of low frequency without constant component. Characteristics which distinguish SCENAR among electric equipment for transcutaneous stimulation: 1) optimal form oh the impulse and the force of the effect; 2) the body almost does not have to adapt to SCENAR impact due to biotechnological feed-back; 3) non-damaging mode of impact; 4) high level abruption of the front of the affecting signal with neutralization of the accommodation effect; 5) many researches have been performed to examine this method of treatment; 6) during the treatment an expert evaluation of the dermal condition can be used to optimize the area of impact; 7) optimal construction of the appliance enables it to work in various conditions [6, 7]. Applying SCENAR-therapy is an issue of huge interest due to its availability, rapid positive effect, simplicity of treatment and steady result. Examining possibilities to perform SCENAR-therapy at various pathological processes accompanied by acute pain in conditions of emergency. Mobilizing adaptive systems of the organism using SCENAR in conditions of acute damage of their functions and analgesic effect were the reason to use the appliance in emergency situations. More than 40 doctors of emergency departments in 13 towns of district of Rostov, Stavropol, Nizhni Novgorod and Adigeia took part in this research. More than 500 patients were helped. The coordination of clinical tests according to special developed map was performed by Emergency department of Faculty of qualification improvement of State Medical University of Rostov and the department of clinical tests of “RITM” Development Bureau, town of Taganrog. Patients with acute pain at three different pathological processes were selected from the database: 1) traumatic injuries of limbs, soft tissue injuries (n=20); 2) steady stenocardia (n=26); 3) hyper-intensive crises (n=153). SCENAR-therapy was performed according to instructions , as dermal areas with located “anti-pain” points were included; if needed methods of general treatment can be added: “three paths on the backbone and six points on the face” and “ collar area, forehead, adrenals”. If there was no possibility to affect the injured organ, “work” with the appliance was performed on symmetric areas. The kin was treated using CHENS-SCENAR appliances without digital methods in mode F1. The therapeutic procedure was performed only once by an emergency department doctor, as the duration of the procedure was 5-30 minutes long, depending on the effect. When the analgesia was ineffective, the doctor could inject analgesic medicine. To evaluate the effect of the analgesia in conditions of emergency, a visual analog scale (VAS) was used, where 0cm = lack of pain, 10cm = maximum pain. The use of itineraries subject to the method “three paths” of the backbone and six points of the face was performed on the grounds of the following: when processing path 2 and 3, Shu-points of the back are included in the area of the impact of SCENAR (points of consent)[4, 10, 11], which are located on the urethra. The itinerary of path 1 is a non-pair rear middle meridian. When areas containing points VG1-VG4 are processed a therapeutic effect is marked on this channel at nervous system diseases, intestinal diseases, diseases of the urino-genital system. When areas containing points VG5-VG8 are processed a therapeutic effect is marked on this channel at nervous system diseases, diseases of gastric and intestinal system. The area of points from VG9 to VG14 – nervous system disorders, pulmonary diseases, fever. Processing six points on the face enables to input information through all the three ramifications of the trigeminus nerve. On the other hand biologically active points of the channels are located in these areas. At least point V2 of the urethra, points E2 and E3 of the gastric channel and G120 of the large intestine, and point E4 of the gastric channel are included in the area of impact of SCENAR. The method “collar, forehead, adrenals” is also related to the areas of general treatment. The use of itineraries in this method is performed due to largely represented reflexogenic areas and biologically active points as the experience of SCENAR-therapy shows [5, 12]. When the indicated itineraries are processed and when the dermal areas are processed “according to instructions”, the appliance may stick. In this case the electrode is not unstuck from the skin but is held on it until further movement becomes possible. If the appliance does not stick, then other kinds of so-called asymmetry can appear (hyperimia, change of the characteristics of the sound, different sensibility etc.). These dermal areas are processed additionally until initial characteristics are changed. Pain at traumas. Analgesia with the use of SCENAR was performed at small and medium traumas: lower limbs fracture (n=5), injuries of soft tissues – limbs, thorax, without damaging respiratory functions (n=9), I and II degree burns of face and abdominal wall (n=2). Cut wounds and bites (n=4). There were nine men and 11 women with age from 11 to 82 (average age – 40.7±3.9). The patients were treated using general means of treatment: splinting, immobilization, non-adhesive bandages in cases of burn etc. 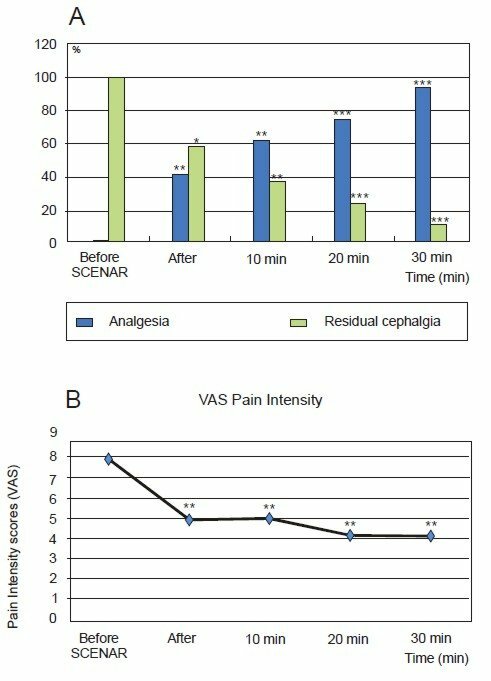 The evaluation of the pain was performed using VAS before the analgesia with SCENAR, immediately after the procedure, and in the 10th and 20th minute. In the same periods of time other complaints and symptoms were defined, as well as the parameters of hemodynamics. The data is shown on fig.1. traumatic pains according to VAS. A distinct reliable analgesic effect developed immediately after the procedure, almost without further increase by the 20th minute. Observations showed that the analgesic effect increases by the 50th – 60th minute. Because the emergency staff cannot follow the efficiency of the procedure for a long period of time, in several cases the doctor made the decision to inject additionally non-opiate analgesic medicine (analgine, ketorolac or ketonal). Only 8 out of 20 patients were injected analgesic medicines. Natural skepticism and caution should be noticed when doctors tested the new method. We regard as an important factor the steadiness of the values of blood pressure. Reliable decrease of the average frequency of cardiac contractions from 85 to 81 beats per minute indirectly shows sympathetic tonus. Reliable change of respiratory frequency was not noticed and it was within normal limits. Decrease of other symptoms and complaints was noticed along with the analgesic effect, such as dizziness, nausea, excitedness and sensation of inhibition. 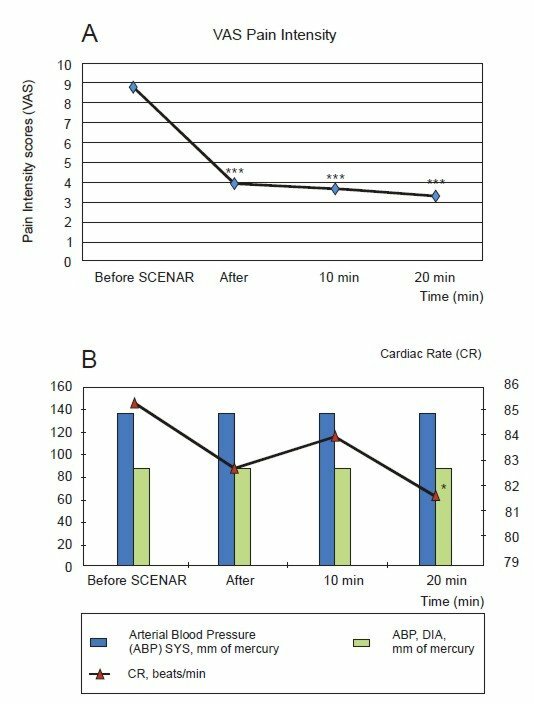 Independent analgesic effect developing on the background of steady parameters of blood pressure end decreasing of symptoms accompanying the traumas is noticed during the process of analgesia using SCENAR for patients with small and medium traumas. Pain at steady stenocardia tension of I-III functional class. 26 patients with ischemic cardiac disease, crises of pain at steady tension stenocardia of different functional classes were treated with SCENAR, as the patients had previous idiosyncrasy to nitrates or lack of efficiency of the nitrates. There were 14 men (average age – 63,1,7±2,5 years old), 12 women (average age – 68.4±3.7 years old). 7 patients had arterial hypertonia as accompanying disease, and 3 of them had osteohondrosis of the backbone. This category of patients was additionally treated with SCENAR as the dermal area of the pericardial channel was processed in the lower part of right forearm and the painful area of skin on the thorax. pains (%) during analgesia of patients with attacks of stenocardia. SCENAR-therapy, according to VAS. Reliability referring to SCENAR data: * – P < 0.05; ** – P < 0.02; *** – P < 0.001. 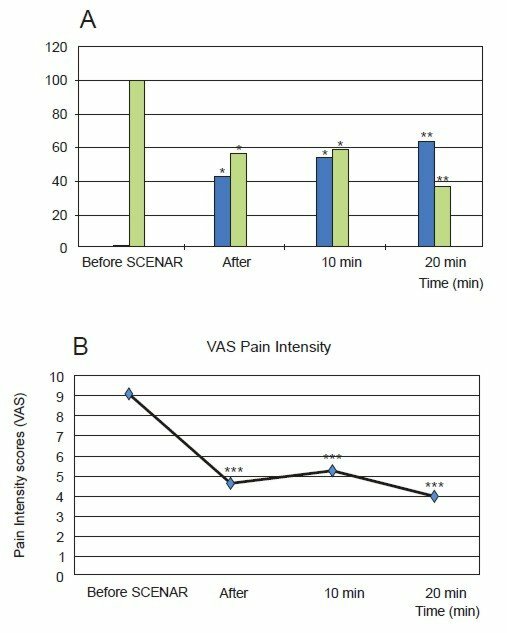 As can be seen in fig.2 (A) immediately after SCENAR-treatment the pain completely disappeared for 46 % of the patients and for 65% of the patients – 20 minutes later. 35% of the patients felt residual pain in the 20th minute of the treatment, but the intensity of the pain was much less, which can be seen in fig 2 (B). These patients, among whom there were mainly patients with accompanying diseases, were offered additional therapy with included symptomatic medicines and non-opiate analgesics. Changes of parameters of blood pressure and pulse statistically did not differ for the category of patients with additional treatment and patients with SCENAR-therapy. This way, analgesia using SCENAR for algic crises at steady tension stenocardia causes sufficient independent analgesic effect, which does not depend on parameters of general pressure. The extent of its correlation with coronary varicose and the endogenous mechanisms which SCENAR starts in order to stop the pain, can be defined in hospital conditions and additional tests. Cardialgia and cephalgia at hypertensive crises. During SCENAR-therapy for patients with neurovegetative form of hypertensive crises normalization of parameters of blood pressure was aimed, not only analgesic effect. A total of 153 patients were helped at their homes on emergency call. To analyze the analgesic effect we divided the patients into 2 groups: with cephalgia (n=137, which forms 90% of the patients; among them 71 patients – 52% had cardialgia); separately data of patients with cardialgia were analyzed (n=78, which is 51% of the patients). Patients of this category were treated by SCENAR, as the skin was processed in the collar area, area of pericardial channel, in the lower part of the right forearm, and dermal projections of maximal pain. Fig.3. A – Dynamics of the complete analgesic effect and number of residual pains (%) during analgesia of patients with cardialgia at hypertensive crisis. 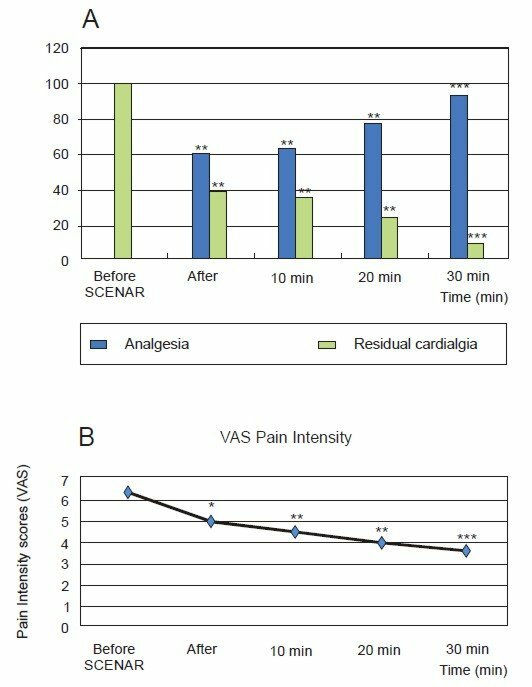 B – Dynamics of analgesia of patients with residual pains during SCENAR-therapy, according to VAS. Reliability referring to SCENAR data: * – P < 0.05; ** – P < 0.02; *** – P < 0.001. In fig. 3 can be seen that immediately after the procedure cardiac pains disappeared for 61% of the patients, and for 91% by the 30th minute. Nevertheless, residual painful sensations were registered by the 30th minute only for 9% of the patients. Their extent was much lower, as at stenocardia, which could be seen during evaluation using visual analog scale (fig. 3 B). This category of patients at times needed an additional injection of non-opiate analgesic. In fig.4, the effect of the appliance can be seen for cephalgia and hypertensive crises at pre-hospital stage of treatment. Fig.4 A shows reliable and gradual elimination of pain. After the procedure the headache disappeared for 43%, and for 88% of patients – by the 30th minute. Residual pains by the 30th minute were registered only for 12% of the patients. Their extent, according to VAS, was much lower than before the procedure (fig.4 B). Unidirectional elimination of pain in cardiac area and headaches was noticed during elimination of hypertensive crisis. 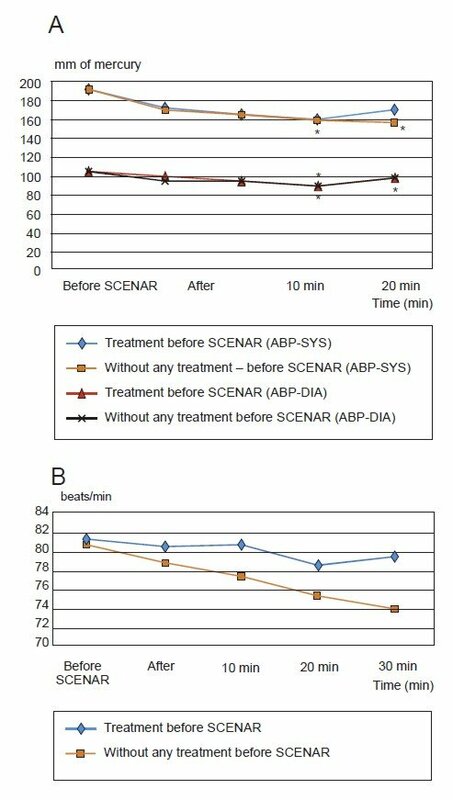 We analyzed the changes of parameters of blood pressure during SCENAR-therapy. Some patients took hypotensive medicines before the emergency staff arrived, which dramatically changes the efficiency of SCENAR. Naturally there was certain skepticism: was it SCENAR that affected or was it previously taken medicines? Fig.4. A – Dynamics of the complete analgesic effect and number of residual pains (%) during analgesia of patients with cephalgia at hypertensive crisis. This is why we divided all the patients into 2 groups: ones who took medicines and ones who did not took medicines before they called the emergency and were treated with SCENAR. Among the patients who had taken hypotensive medicines before the emergency arrived (calcium antagonists, ?-adrenoblockers, APF inhibitors etc) 30-90 minutes before that without any effect there were 80 people (58 women, 22 men; average age – 61.1±4.9 years old). The group of patients who did not take medicines before calling the emergency contained 73 people (52 women, 21 men; average age – 63.1±3.5 years old). The results are shown in fig.5. Fig.5. A – Dynamics of parameters of blood pressure during SCENAR-therapy of hypertensive crises in the group of patients who had taken and who had not taken hypotensive medicines before the emergency staff arrived. Fig.6. 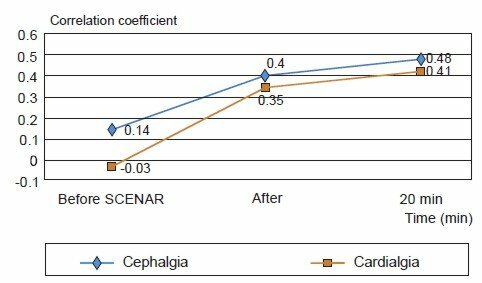 Dynamics of correlation coefficient depending on the decrease of systolic blood pressure and decrease of painful sensibility at cephalgia and cardialgia, according to VAS. ing the process of analgesia the analgesic effect develops independently for patients with traumas, then during attack of pain at steady stenocardia and particularly hypertensive crises, the analgesia probably depends mostly on recovering of functions and decrease of ischemia: the decrease of system blood circulation and normalization of regional blood circulation including the coronary one. We analyzed the dynamics of correlation coefficient depending on the decrease of systolic blood pressure and the extent of headache and cardiac ache, according to visual analog scale. The data is represented in fig.6. As can be seen in this figure the correlation coefficient increases simultaneously with the decrease of the systolic blood pressure and decrease of values of extent of cardialgia and cephalgia, according to VAS. If in the beginning of the crisis the extent of the pain did not depend on the values of blood pressure, then SCENAR-therapy led to increase of the correlation to 0.41 and 0.48. Similar dynamics of close relation and its lack in the beginning of the crisis probably shows simultaneously developing effects of SCENAR: analgesic effect and the effect, which normalizes the functional system of blood pressure regulation. This way, the elimination of neurovegetative form of hypertensive crises using SCENAR regardless of preliminary therapy leads to gradual decrease of parameters of blood pressure and frequency of cardiac contractions. Distinct analgesic effect of cephalgia and cardialgia is noticed, which probably has a mixed nature. During the process of elimination of acute pain with different origins, three elements should be present in the algorithm: possible elimination of reason causing pain; affecting the sensation of pain – perception; possible prophylactics of pathophysiological damages, which pain causes or will cause. As the experience of work with SCENAR shows, during the treatment of acute and chronic painful syndromes, the data presented in this article show the multicompoundness of the suggested therapy. Non-medical method of elimination of acute pain starts the endogenous antinociception and other mechanisms of recovering damaged functional systems. The analysis of the data obtained in traumatology and cardiology shows that the share of perceptual component of SCENAR analgesia is different depending on nosology, the level and the volume of the damage. It is not reasonable to rely on only one single method of analgesia and it is also dangerous for the patient, especially in case of emergency. Undoubtedly, the morphologic substrate of the analgesic effect of SCENAR-therapy are the antinociceptional systems of brain, started from the different areas of skin. SCENAR works with the biologically active points, with their accumulation and the surrounding tissues – this a zonal appliance. Due to its technical solution, it “finds” these points independently. As shown for acupuncture analgesia , in opioidergic, serotoninergic, catecholaminergic, cholinergic, gamkergic and possibly other mechanisms take part in its realization. Some authors regard the transcutaneous electro-stimulation as the most accessible and the simplest “hyperstimulation analgesia” to be realized. If we proceed from the theory of Melzack and Wall (1965) the activity in the thin non-myelinized C-fibers located in the jelly substance of the rear horns of the spinal cord “opens the gates” to the further pass of nervous impulses bearing the information of pain. The role of the thick fibers consists in the ability to “close the gates”. One of the hypotheses of the analgesic effect of transcutaneous neurostimulation consists of the fact that the procedure leads to activation of thick myelinic fibers with subsequent “locking the painful entrance”. The analgesic effect during the so-called dynamic neurostimulation is proved to be naloxone-dependent . Using almost the same methods of SCENAR-therapy and taking under consideration the principles of heir application [5,6,12], we obtained unidirectional results: analgesic effect and final positive sanogenic result connected with normalization of the changed functional system. Taking under consideration the limited volume of such a publication we can mention that similar unidirectional results were obtained during the process of therapy of acute myocardial infarction, burns, bronchial asthma of adults and infants etc. The simplicity of use of SCENAR allows us to recommend the use of this kind of analgesia in any conditions and if needed, by people without medical education. The SCENAR-therapy (self-controlled, energy neuro-adaptive regulator) is an effective, safe and multifactor non-pharmaceutical method of analgesia during treatment of different conditions accompanied by acute pain in cases of emergency. During the process of analgesia using SCENAR the patients with small and medium trauma (n=20), an independent analgesic effect is noticed (60%) developing on the background of steady parameters of blood pressure and decrease the symptoms accompanying traumas. The analgesia of algic attacks at ischemic disease and steady tension stenocardia (n=26) using SCENAR, causes a sufficient independent analgesic effect (66%), which does not depend on the parameters of general pressure. The elimination of neurovegetative form of hypertensive crises (n=153) using SCENAR, regardless of preliminary medical therapy leads to gradual reliable decrease of the frequency of cardiac contractions and decrease the parameters of blood pressure by the 2oth minute after the procedure; by the 30th minute a distinct analgesia of cephalgia and cardialgia is noticed (88-91% respectively). Abakyan G.N. Reflexotherapy of nervous diseases system. M., 1999. – 297p. Barashkov G.N. Reflexotherapy of pain. – ?. : NCM “Universimed”publishing house “TM – OKO”, 1995. – 263?. Vasilenko A.M. Acupuncture and reflexology: the evolution of methodology and metatheory. – Taganrog. 1998. – P. 110. Vogralik VG, Vogalik MV Acupuncture. Fundamentals of traditional eastern reflexodiagnostics and puncture adaptive-energizing therapy: Qi-gun. – M.: GOU VUNMTS of the Russian Federation, 2001. – P. 33. Grinberg Ya.Z. To the question on the basis of the effectiveness of SCENAR-therapy / SCENAR-therapy and SCENAR expertise. – Taganrog 1997. – Issue 3. – P.16-22.7. Grinberg Ya.Z. The concept of electrotherapy / SCENAR-therapy and SCENAR- expertise. – Taganrog, 1999. – issue 5 – P.16-138. Ignatov Yu.D., Kachan AT, Vasilyev Yu.N. Acupuncture analgesia: Experimentally-clinical aspects. L.Meditsina, 1990. – P. 256.9. Luvsan Gaava. Essays on the method of oriental reflexotherapy. Novosibirsk: Science, 1991. – P. 432. Machareth EL, Korkushko A.O. The fundamentals of electro and acupuncture – Kiev: Zdorovya, 1993. – P.391. AN Revenko, AV Tarakanov. and others. Instructions for the use of percutaneous electroneurostimulant with bio-inverse communication of individually-dosed effect on the reflex zones. CHENS-SCENAR. – Taganrog, 2004. P. 70.